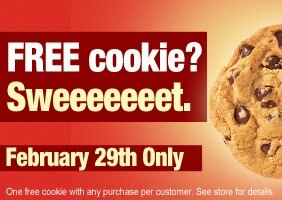 Get a Free Cookie today at Subway! Just thought I would share these super Leap Day deals with my fellow ECG contestants! Check out these yummy discounted deals. The New Zealand Medical Journal (hence the British-isms like crisps and lollies) has just published the NEEDNT, or non-essential, energy dense, nutritionally deficient, list. I'm glad it was noted that the list of 49 food items is alphabetical, not in descending "non-essential" order. It's worth looking over and thinking about how many of these items are in your house or are a regular part of your intake. Woohoo! It's free pancakes today guys! Go get your free pancakes!!!! Note: This was a TEST. If you clicked on the link above, you FAILED!!! Pssst, Chris, free pancakes bro. Do it. Do it. Do it. Though this goes against the Lenten season we find ourselves in now, I’m a firm believer in not denying myself anything outright during “diet”/healthier eating phases of my life. They say that those who do deny themselves will just end up bingeing on whatever they’ve held back from. I opt for moderation—and though I’m a Libra—it’s not a quality that comes naturally to me whatsoever. Still, I do it because there are some things I will never give up entirely. And by “some things” I mean alcohol. With ECG, I’m now having to make some choices. If I want to have a drink, I’m going to have to give up something else somewhere. Perhaps I’ll “drink my dessert” or have a lighter snack so that I can enjoy a glass of wine when cooking. And certainly, because I’m me, there will still be times where “going out for a few pints” will really be a few pints, followed by some organic beer at the Muzas, and topped off with some Coors Lights with Uncle Artie (no relation) at the Blarney Cove. In case you don’t think those adult beverage calories will add up, check out this alcohol calorie counter. Week 3 results are in. We finally got 100% reporting—thank you! Chris Brand continues to dominate the field as the weight loss percentage leader. I know the rest of us have had a slow start, but remember, ECG VI is a marathon, not a sprint. There’s plenty of time to recommit and to start challenging Chris’s lead. Music. It can make or break a workout. It’s proven to help you run faster and has even been referred to as the only ”legal drug” in sports. Again, I’m sure there’s an app for that to find tunes that maximize your time on the treadmill. I’m non-technical and don’t even have any music on my phone so I rely on my Britney Spears Channel on Pandora. Still, nothing beats a playlist with the best music for you to work out to. I realize this is extremely subjective. My recent high-speed jams have been Rock Party Anthem by LMFAO, Take it Off by Ke$ha, and to be painstakingly specific, the Benny Benassi Radio Edit of Katy Perry’s E.T. Apparently, what I lack in ability to ever fit into size 4 pants I make up for in terrible taste in music. Anyway, I encourage everyone to make a playlist they love and it will make time doing exercise even better. My apologies if any of my previous posts were misleading, but people interpreted Al's "bonus points" rule for ECG VI differently. Since there's been some question, we've got an official ruling: The 3 bonus points are ONE TIME ONLY. You're welcome to do as many races as you want during the competition, but you'll only get 3 bonus points ONCE. Congrats again to Chris Brand who remains the weight loss percentage leader. Though Erica Sorg is close behind with 3 bonus points and almost 2% weight loss so far! **A note to anyone who doesn’t respond with weights--other than my Wednesday morning email, I won’t chase you down, so if I don’t have weights by Wednesday night, on Thursday I will report using your last weigh-in weight with an asterisk noting non-reporting for the week. This seems fair to me, but let me know if you have a problem with that--or, just email me your weights. I had actually never been tempted by shakes or frozen diet meals, I’d never even tried them (Stouffer’s French Bread Pizzas clearly don’t count, but damn I loved those), but I realized that it’s something that a lot of people try or even rely on in their lives. Lean Cuisine, SlimFast, NutriSystem, Jenny Craig (side bar: if when you encounter me drunk, I do an awesome Jenny Craig impression, just ask Annie). Again, I’m not saying these things are bad, but it made so much sense to me that “real” food, not prepackaged meals and supplements, would always be my go-to. I’m also not one to opt for non-fat (low-fat is fine), but that’s another story. There are a few real food items that are staples on my shopping list, including tomatoes, whole wheat pita, plain low-fat yogurt, baby carrots, eggs, lettuce, apples, 2% milk. What are your go-to food items in your house? Steve & I were up bright and early on Saturday morning too, but I must say that the weather in Miami was WAY kinder than what you experienced. This 5K was organized in memory of Colin Myrtetus, an Epiphany and Columbus Alumni who passed away suddenly last year at age 38. The day was perfect for the event - cool & overcast. Steve has been battling a bad cold and so the morning of the 5K he made the wise decision to walk with me instead of run. He's still slightly upset about that. I am not looking forward to tomorrow's weigh in. I have been completely indulgent in my diet and Valentine's day was just another excuse to eat poorly. But, tomorrow is a new day! After warming ourselves with a healthy breakfast of steel cut oats and fresh ginger tea, Erica and I braved the snow to complete 3.2 miles with about 2000 other runners. Though the weather was miserable, we had a good time overall. Earning 3 bonus points wasn't bad either! Mary and Steve--we hope your race was just as fun--would you blog about it as well? For those interested in doing other races, I'll be scoping out some others in NYC. 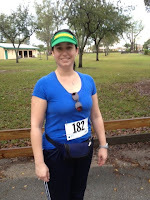 Erica is already aiming for the NYC Dualthon (2 mi run, 10 mi bike, 2 mi run). What races do you have planned? Congrats to Chris Brand, weight loss percentage leader! He’s already down 3% which means he’s got 3 points so far. But don’t get complacent Chris—4 ECGers (myself, Erica, Steve, Mary)** have signed up for races this weekend, and each will be earning 3 bonus points! **UPDATE: Chris and Kristi have signed up for the Disney Family 5K on February 25, so we'll all have a lot of catching up to do! We don’t always realize this, and sometimes, companies are kind enough to remind us (thank you, Kettle Brand’s “sharing size”). In addition to a Workout Tracker, another tactic I used in last year’s ECG was the half-portion when eating out. No matter where I was, and unless I ordered something small like an appetizer as my main dish, I cut my meal in half and packed it up or shared it. I know it might seem like a waste when you spend money to go out and not eat all of it, but in the long-run, it really pays off. I actually never felt hungry when I was done. And because I’m an infamously fast eater (a terrible habit), it forced me to slow down and savor what I did have. I confess, since ECG V ended, so has this particular habit, but it’s one I’m ready to embrace again with ECG VI. While at home, my measuring cups and spoons are always on hand for things like cereal (1 cup), salad dressing (2 tbs), trail mix (1/4 cup), rice (1/4 cup) and dinner servings (1-2 cups). This is another thing that doesn’t work for everyone, but it really helped me understand serving sizes. Unlike Helen Gurley Brown, the skeletal editor of Cosmo who extolled the beauty of waifs and whose idea of a “sensuous meal” was “a scallop and a packet of Sweet N Low”) (shout out to Annie who did a killer impression of this ancient SNL skit), I believe in satisfying meals with more realistic portions. Maybe 1/2 portions when dining out will help as you start week 2 of the competition? One method that lots of people who are trying to lose weight use is the food journal. I used to keep one for months at a time, adhering to the If you bite it, you must write it. mantra. But I hated those occasional, and sometimes frequent entries that read something like, “six pints of beer and a quesadilla” following a night out. I loathed writing that, even though it was true. But to me, it was obvious. I knew that was not a shining moment, so why did I need a permanent record of it? I mean, what would your food journal say about yesterday’s Super Bowl parties? Actually, starting with last year’s ECG, I opted instead for what I call the “Workout Tracker.” There’s an app for that [for iPhone; for Android, though there are literally hundreds of others], but for me, it was a simple spreadsheet with every day of the year, and what I did for physical fitness on each day. That way, at the end of each week, I could see, whoops, I only worked out twice, I should go for a run right now! Or I could see that my 6 days of working out lead to a greater weight loss that week. It showed the good things I was doing each week, my accomplishments, not my failures. To this day, even the act of entering my workouts into Excel feels like a small victory. It’s different for everyone, but please don’t let the weekly weigh-ins be the only measure of your life for the next 12 weeks! Head to the comments to share what works for you! These are the official starting weights. I'll email you each Wednesday to ask for your weights and the updated spreadsheet will be posted each Thursday. Erica and I have signed up for the Cupid's 5K--anyone else signed up for a race?